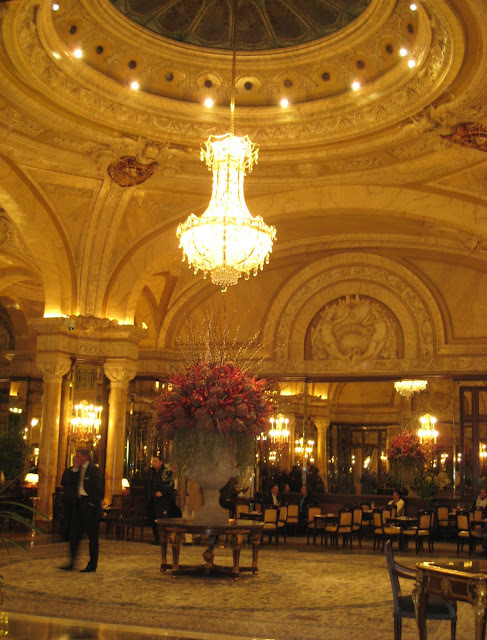 Another view of the magnificent lobby of the Hôtel de Paris. Note the enormous floral display in the centre. The hotel was built in 1864 and offered the very best in comfort and sophisticated décor. It was here, in the Hôtel de Paris, that the most eminent guests came to stay and where the most prestigious society events took place. Its rare woods and rich fabrics, its golden and pastel décors, all conspire to recall the hotel's fabulous past. The hotel has 196 rooms and suits. I took the photograph as I walked back from the famous Empire Room which was unfortunately closed and curtained - so no photograph for you. I'm not sure if this photograph isn't slightly out of focus - one isn't supposed to photograph inside the Hôtel de Paris - and this one I snapped quickly. My companion had asked permission for me to take yesterday's bronze horse, and seeing the lobby relatively empty at that moment, the door man agreed 'mais un seul' he said. I was lucky. This one was taken as we returned to the lobby from the Empire Room, en route to the American Bar - where tomorrow we'll have pink champagne. It is truly beautiful Jilly. I took the virtual tour of the restaurant too. What a magnificent place. Wouldn't it be nice to be able to afford to eat there. I wonder what is on the menu. I can imagine escargots at least and Venison, perhaps Duck a l'Orange but not cassoulet. Still WAY TOO UNDER-DRESSED! Oy! And what a sneaky snapper you are Jilly. I am so tickled. What dangers you brave for our delights. Thank you so much. It IS a neat shot, and a wonderful place to see. Thanks for the "insider's view". Otherwise, none of us would be able to see the lobby of the magnificient hotel. Oh la la! It is very pompous. You did a good job for snaping this one quickly, Ms.paparazza. Yes you did a great job. It's absolutely wonderful !